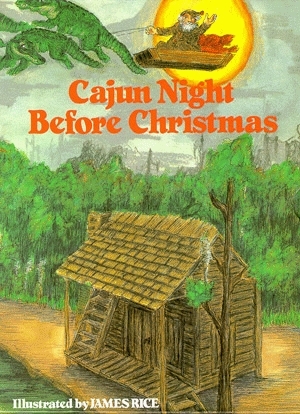 The Cajun Night Before Christmas® has been a part of Louisiana’s holiday traditions since it was first published. Now, more than forty-five years later, a new generation is discovering the charm of Gaston® the Green-Nosed Alligator. First conceived by J.B. Kling, Jr. writing as ‘Trosclair’, the CLIO award-winning sales jingle for the Bergeron Plymouth Company in New Orleans was based on the Clement Moore poem. The exclusive rights were purchased by Pelican Publishing Company and the illustrations of then-fledgling artist James Rice brought the story to life. Beloved master storyteller Coleen Salley narrated the read-along CD. Radio personality and voice talent Tommy Joe Breaux became the voice behind the recordings at City Park and on the audio version of the adventures of Gaston®. The book also created what has become the largest segment at Pelican Publishing—the children’s book division. With the passing of publisher Dr. Milburn Calhoun and his wife Nancy Calhoun, illustrator James Rice, and the loss of Colleen Salley, the people behind the creation of the story are mostly gone. What remains is a long legacy of delight. Each year at the Celebration in the Oaks light show featuring the classic cabin from the story, dedicated staff from Pelican Publishing collect memories of attendees as they flow through the premiere preview parties. From now grown children who remember it as the first Louisiana tale they ever heard to young parents who laugh about a non-Louisiana spouse reading it to their children in full-blown Cajun accent, the book is universally loved and remembered. Teachers talk about how they use it in the classroom, business people mention they send it to out of state clients, and children laugh as they try to mimic the dialect that has all but disappeared from everyday life. The classic tale has been interpreted in gingerbread houses in competitions as far away as California and in cakes at the Edible Book competition at NOMA in New Orleans. For years, the miniature book ornaments have appeared on Christmas trees across the country as a reminder of a faraway Louisiana home. Even the New York Times praised the lilt, the humor, and the rough-hewn drawings of the Cajun tale. At Pelican Publishing, a huge portrait of Gaston® and his bearded friend hangs in the boardroom watching over each new author and illustrator that joins the family. James Rice, in his long, distinguished career as an author and illustrator, has produced fifty-plus children’s books, among them an addition to the Night Before Christmas Series, Gullah Night Before Christmas.